Book Lovers Life: Audiobook Review: Extinction Evolution by Nicholas Sansbury Smith and Giveaway! 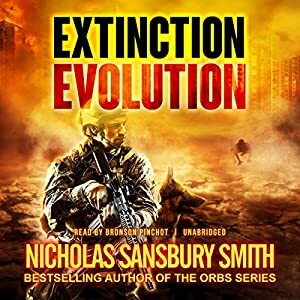 Audiobook Review: Extinction Evolution by Nicholas Sansbury Smith and Giveaway! There's a storm on the horizon....Central Command is gone, the military is fractured, and the surviving members of Team Ghost, led by Master Sergeant Reed Beckham, have been pushed to the breaking point. While the strong return to the battlefield, the wounded are forced to stay behind on Plum Island and fight their inner demons.Betrayed by the country they swore to defend and surrounded by enemies on all sides, Team Ghost has one mission left: protect Dr. Kate Lovato and Dr. Pat Ellis while they develop a weapon to defeat the Variants once and for all. But after a grisly discovery in Atlanta, Kate and Ellis realize their weapon might not be able to stop the evolution of the monsters.Joined by unexpected allies and facing a new threat none of them saw coming, the survivors are running out of time to save the human race from extinction. Wow is pretty much the sentiment I had when I finished this one! I was literally breathless. The ending killed me!!!! I cried those big ugly tears and.... and my poor heart!!! There is so much I want to say about a certain part but I can't and I'm heartbroken!!!! Anyways, book 4 is bigger and better than ever. This one sees some new characters introduced, the Variant Hunters! They are sent on a recon mission and discover something that changes everything. The Variants are breeding!! They are also evolving in ways no one predicted. Meanwhile, after the ending of book 3, Beckham and his team are on edge waiting for the ramifications of their actions. But what comes is more help for Plum Island whilst Beckham and Kate are taken somewhere else. Kate and Ellis are so close to a breakthrough but when they learn of the kid Variants, their work just got a thousand times harder. Now they need to capture a live specimen of a juvenile to see if the weapon will affect them as much as their parents. There is so much more happening and so much more I want to say but I can't!!! One thing I love about these books is the characters. It's not often that a book captivates me so much, but this series has. Every single character has captured my heart and I have become invested in their stories. I found myself on the edge of my seat when they go into danger and gasping and cringing and crying with them! It's a testimony to how good a writer this author is, because he made these characters so real, with so much soul. Every single book so far has been jam packed with action, but this one takes it to new level. I honestly felt like my heart was in my mouth the whole way through, and then we have the battle on Plum Island, and I just broke!! I'm truly finding it hard to put into words just how good this book is, and indeed the series!!! It's always the way with me though, when I read a book that blows me away, I'm always left speechless and just want to say... go buy it now!! Read it and see!! I also love how over the course of the series the Variants have evolved. Every single book brings something new about them and it's refreshing to see. It shows how much research the author put into them as well. The way it started and the evolution of them to now was seamless and and extremely well executed. I so would love to see this on the big screen!!! Anyway, in case you can't tell, I love this series and can't recommend it enough. It is action packed, filled with amazing characters, exceptionally written and filled with so much....... awesomeness that this author has made it firmly onto my favourite list!! After reading the first one I went and bought all the rest of his books. Seriously brilliant series and I highly highly recommend!!!! Again, Bronson Pinchot was amazing. He brought the book to life and nailed the performance. He has a broad range of tones and voices and had the right inflections at the right time.